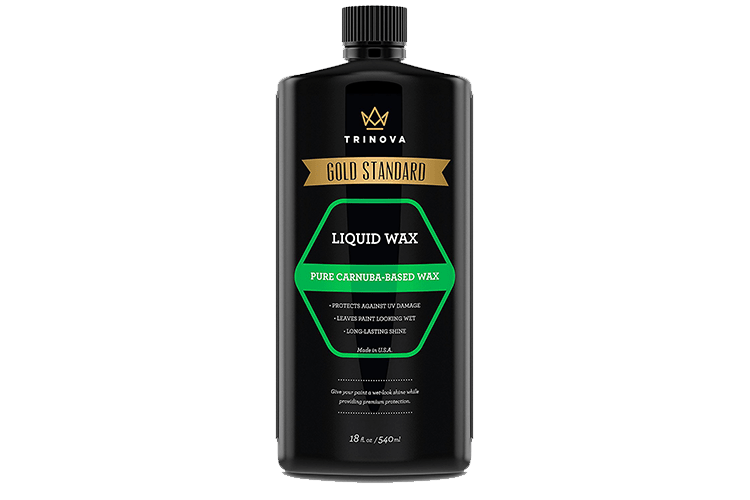 Just a 1/2 ounce of TriNova Waterless Car Wash & Wax concentrate makes a full bottle, more than enough to clean a standard sized car. 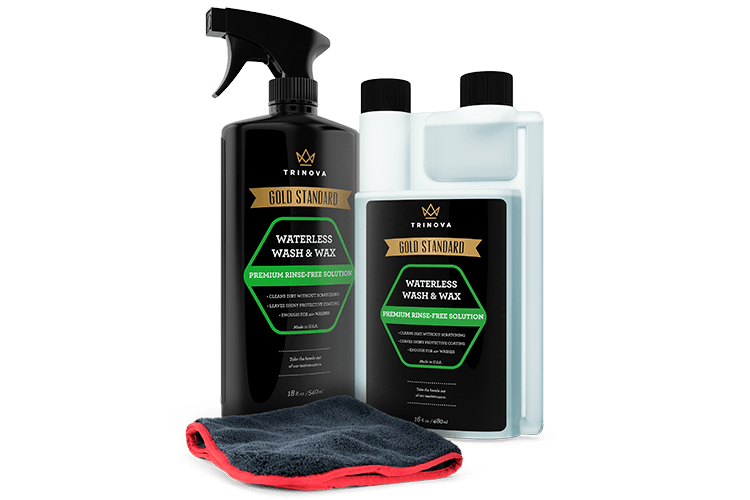 Our product was specifically designed to encapsulate dirt, grime, and residue to wipe off without scratching paint while providing a protective coat that repels water and blocks harmful UV rays. No hoses, no buckets, no mess. Just spray on, and wipe off. Better than soap alone! Remove cap from measuring chamber. Gently squeeze bottle until 1/2 oz of concentrate has filled the chamber, then release. Pour concentrate into supplied spray bottle. Fill spray bottle with water and attach sprayer. Hose off severe buildup before application. Mist surface using 1-2 sprays for every 3-foot section. Gently wipe with a clean, dry microfiber towel. 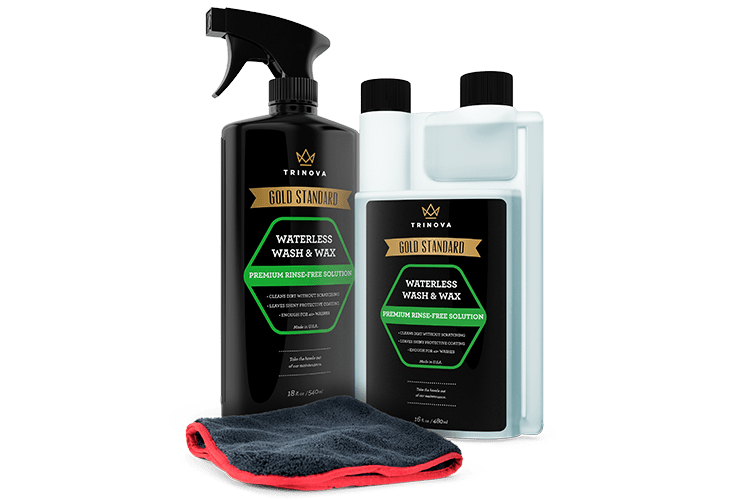 TriNova® Waterless Car Wash & Wax is rated 5.0 out of 5 by 4. Rated 5 out of 5 by Lani from love this stuff. giving this a 5 star does no justification for how the product performs and how easy it is to use. easy to apply and easy to wipe off. u don't need elbow grease in comparison to some of the waterless car washes available on the market. no weird haze swirlies that you have to buff out. applied this in the sun with no problems. also worked wonderful as a clay bar luber. awesome stuff. 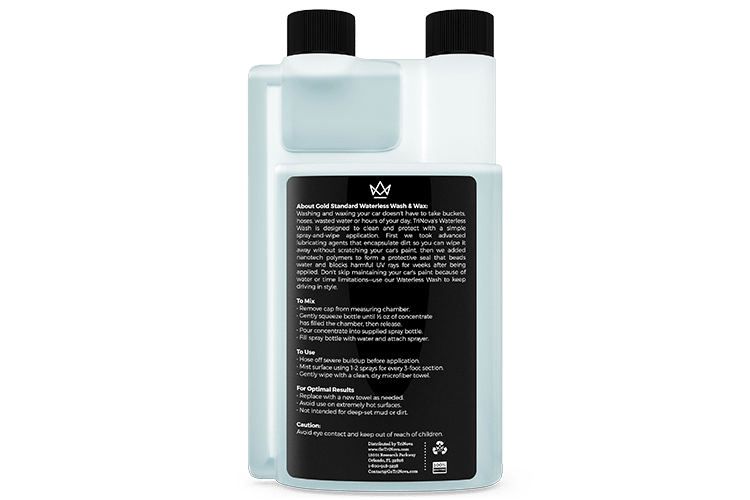 i have used a handful of waterless car washes, and this has even outdone a more expensive, preferred product. also love that this is economical! a really good bang for your buck! i just ordered the kit and cant wait to try out those products as well!! 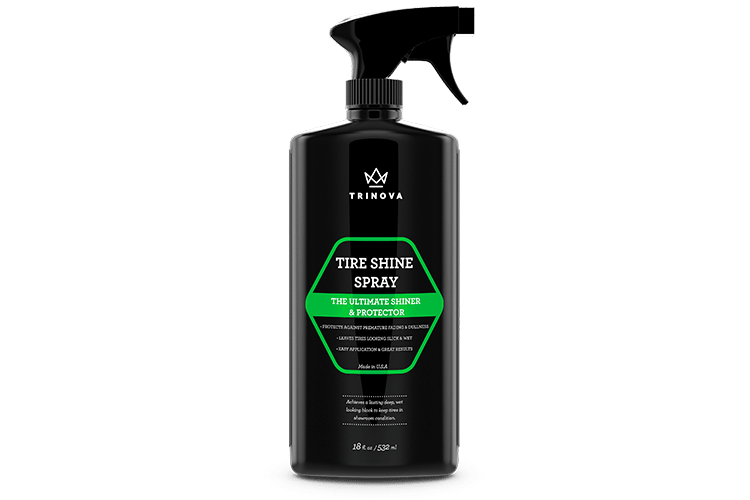 Rated 5 out of 5 by Joe Mish from Fast and Easy quick Detailer I use all of Tri Nova Care Care products. This one works excellent when car has dust film from Garage. 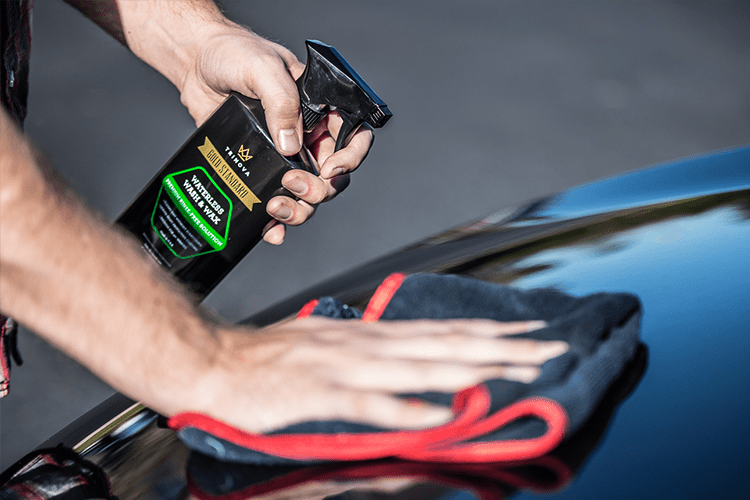 Rated 5 out of 5 by Mike from Awesome Very easy to use and gives the car a nice just waxed shine. 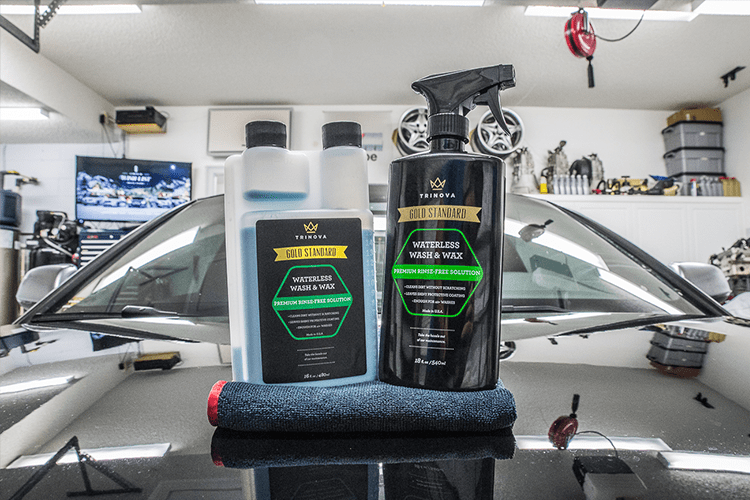 Rated 5 out of 5 by Klasse Act from A complete waterless wash kit! So I've been using waterless and rinseless washes since 2011, I've tried and used MANY, this one is the upper crust without a doubt. The thing here is you get the bottle with built in measuring cup so you don't make it too strong or too weak, not everyone does that but the real nice thing is you also get your own spray bottle with it too, marked with what's inside, much appreciated. 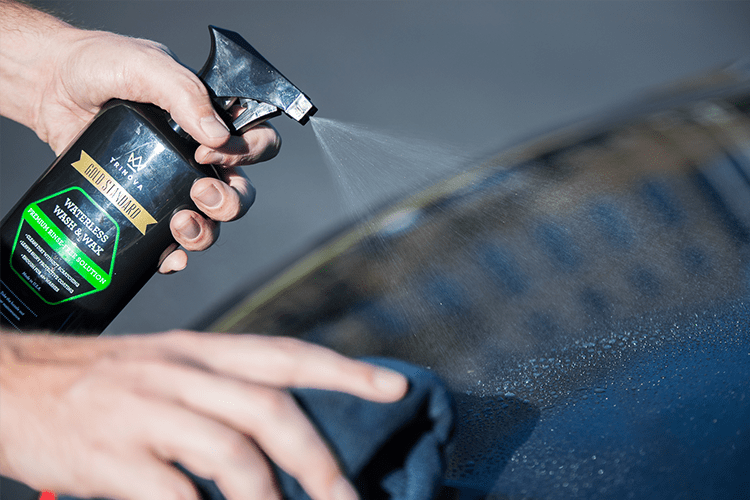 Knowing when to use a waterless wash is key. If the car was washed on say a Monday it might be a little dusty by say Wed/Thursday (o have healthy obsession for clean, sorry, LOL) so this makes getting your car clean and fresh easy, not to mention adding some protection as well. It can also be used if your car has been driven in the rain or sits in the rain as well, here's how you use it. To wash the car get some edgeless, plush mf towels, say about 6 of them, depending on the size of your car and then make up your waterless wash. To make it follow the directions and tap water is fine, no problem, but using distilled water will eliminate any chance of watersports if the water comes out of some area of the car when done. 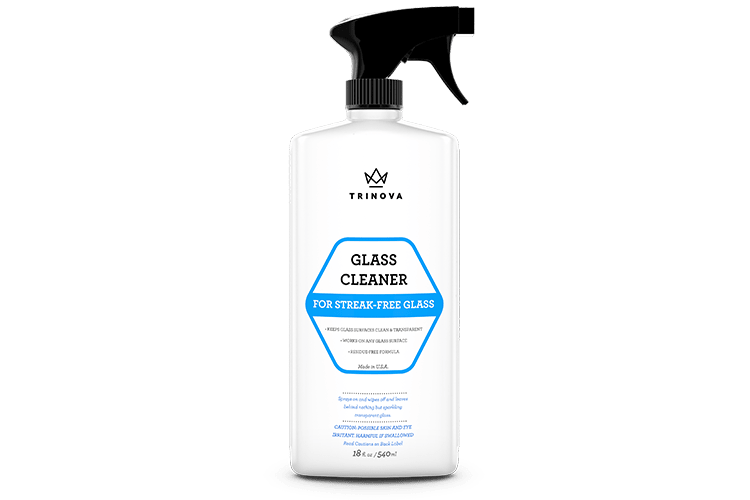 Also if you make up the TriNova WW in bulk, say a gallon, the distilled water doesn't break down the product over time the gallon is sitting. Oh yeah, on to the wash, LOL. Spray a section at a time, ensuring total coverage and take your mf towel, folded into 4's and make an even, measured swipe and inspect your towel. You should see a dirt line, depending on how dirty your car is, no problem, just roll that section under and use the remaining part of that particular square, you should get 2-3 swipes per square. Once you've used all 8 squares put the dirty towel to the side and grab another towel and keep moving along. This can also clean glass and rims but for later I'd have designated wheel and tire towels, not ones you'd use on the car. I have a Fiat 500 Abarth and to do a WW on it takes me about 35-45 minutes and that includes the entire car, jams and wheel faces. It's so easy to do you'll kick yourself as to why you didn't try it sooner and this product is one of the best out there, period! It's also great for road trips to keep your car clean of bugs and grit at the hotel.